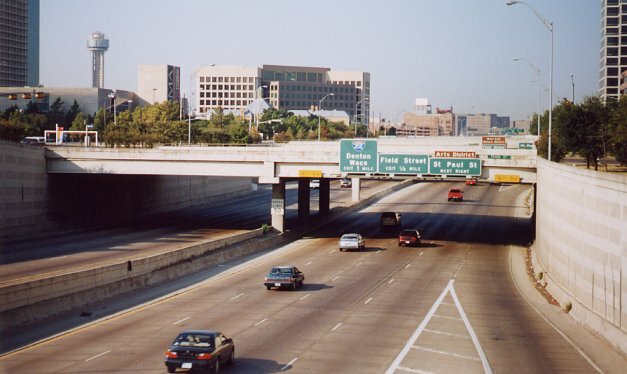 Like most major downtown areas, downtown Dallas is surrounded on all sides by freeways. Downtown Dallas is also the location of the "mixmaster", which is the convergence of I-35E and I-30 on the southwest side of downtown. This area has become so congested that plans are being developed to build the Trinity Tollway, a new 8-lane tollway that will bypass downtown along the Trinity River. The tollway is embroiled in controversy as of 2000, but chances are good that it will be built. Spur 366, more commonly known as the Woodall Rogers freeway, is in a trench on the north side of downtown Dallas. I'm not sure exactly when this freeway was constructed, but it was sometime in the 1970's. This is the existing terminus of the Woodall Rogers freeway, just west of I-35E. The freeway will be extended westward with a new $67 million "signature" bridge over the Trinity River. Work should start around 2004. Aerial view of the location of the upcoming Woodall Rogers Freeway bridge over the Trinity River. 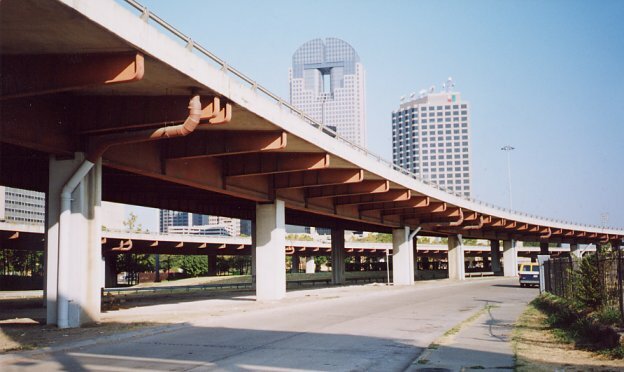 I-45/US75 on the eastern side of downtown is entirely elevated. It was completed in the mid 1970's. The four-level stack at I-45 and I-30. I-45 is on top. Interstate 30 on the south side of downtown Dallas. This freeway is in a trench. All lanes shown in the photograph are freeway lanes. (The outer lanes are not feeders.) This freeway was constructed around 1960.